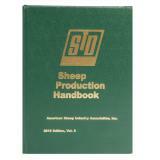 Gold standard of USA sheep books. 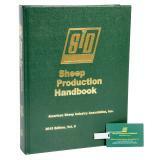 Owning this book is well worth the high $ if you raise sheep! Much improved 2015 Edition, Vol. 8. (Includes a thumb drive.) Hardcover. 1164 pp. Listed below are recommended optional components or related items. Your particular situation may require alternative recommendations. Please call and talk to our consultants if there are any questions at 800-282-6631. The best modern guide we've seen by far. Highly recommended for all Midwest shepherds who pasture sheep. Provides a detailed schedule based on your lambing date. By Pipestone Sheep School. Number of reviews: 2 customers reviewed this product. Recommended: 2 out of 2 said they would recommend this product to a friend. You must be logged in to leave a review. Please sign in. A must have for anyone that really is a shepherd and not just a sheep haver. The price is low compared to the vast amount of info that it contains. A real text-book. 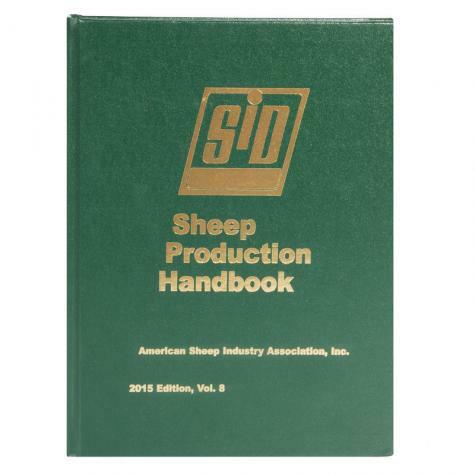 Solid sheep production handbook with lots of good info. not a must have for the back yard flock. but it is nice to turn to when you have a question. Conductivity measures the amount of electrical current a material can carry. The opposite measure is known as resistance. Many of Premier’s nets feature a green and white superconductor that has both stainless steel and tinned copper filaments for optimal conductivity. These “premium” nets are 10 times more conductive (38 ohms per 1000') than our “basic” nets. This enables the electric pulse to travel much farther and be less affected by weed contact. Customers who are unhappy with netting are often those who’ve chosen one of these or their farmstore equivalents. Why do we offer them? Because they are similar in design and conductivity (380 ohms) to nets from our competitors—and comparisons make decisions easier. The best choice, unless your soils are always soft or very hard. Posts allow you to push in the spikes with your foot. When soil is hard or rocky, double spikes are more difficult to install and remove. Allows use of a mallet or dead blow hammer for installing posts in dry, hard or rocky soil. Features a “spike stop” for extra support and internal fiberglass ribs for added strength. Tip: To insert a line post into frozen or hard soil, use a power tool to drill pilot holes. * Not all fences have all line post options. Conventional electrified fence systems rely on soil moisture to be effective. However, not all areas have the required moisture. Dry soil increases resistance—a weaker, less effective pulse occurs that does not deter animals. To overcome this, Pos/Neg nets* are wired to allow the use of every other horizontal strand as an extension of the ground terminal. Because half the strands are connected to the ground terminal or ground rod, reliance on soil moisture is reduced. A PowerLink must be purchased separately to make the secondary ground connection. In order to receive a shock, the animal must touch both a positive (hot) and negative (grounded) strand at the same time. This will deliver more pain to the animal than an all hot net (Pos/Pos) because moisture in the soil is not required to complete the circuit. Pos/Neg fences can be converted to Pos/Pos in moist conditions. Remember, all fences must be kept free of vegetation. * Not all fences have Pos/Neg options. Buy a larger energizer than necessary. When the fence pleases, most folks will buy more fence—and need additional output. Use a low-impedance intermittent pulse energizer. Use a fence tester to check the voltage often. Use enough ground rod(s)—included with our energizer kits. Don’t allow your lead acid battery to discharge below 40%. Use insulated wire that is designed for electric fences. Always connect the fence to an energizer, not an outlet. Visit this link for answers to other common energizer questions. Solar units are very portable. Because they need a battery, these units are more costly to purchase and operate than plug-in units. Batteries are less effective in cold temperatures (deplete faster). Most farmstore solar units are too weak, in joules of output, to properly energize netting. That’s why we designed our own. Least cost to purchase and operate per joule of output. Best for fences exposed to heavy vegetation. Cold temperatures do not affect performance. Recommended for whole-farm systems, but can be complex to install. Higher output requires more ground rods, underground cables, multiple output terminals, etc. Dan Morrical joined the Iowa State University staff in 1984 as Extension Sheep Specialist after completing his doctorate degree at New Mexico State University. He held the rank of Full Professor as of July 1, 1995 and retired from full-time teaching in 2017. While at Iowa State University, Dr. Dan Morrical was responsible for educational programs in all areas of sheep production, ranging from nutrition, genetics, marketing and management. Research areas focused on applied projects in the areas of nutrition, forage utilization, genetics, out-of-season breeding and lamb survival. Dr. Morrical has been heavily involved in providing educational resources to the sheep industry. He has authored over 30 extension fact sheets, ration balancing software programs, grazing videos and co-authored the nutrition chapter of the SID Handbook with Dr. Margaret Benson from Washington State University. Dr. Morrical now serves as Premier’s on-staff small ruminant nutritionist and sheep production advisor. Most recently, he’s introduced a line of “GOLD FORMULA” mineral premixes under The Shepherd’s Choice® brand, aimed to maximize hoof health and immunity.